on one industry. Photo courtesy Virginia Tourism Corp. When news came in March that Norfolk Southern would close its Roanoke administrative offices, moving 426 jobs to Norfolk and Atlanta, many city residents feared for the city’s economic future. After all, Norfolk and Western Railway’s decision to build in Roanoke in the 1880s kick-started the “Magic City’s” growth and long served as its leading industry. Yet, the railroad has waned in influence and employment for decades, shrinking a local workforce of more than 5,000 people at its height to 1,200 today. The closure of the administrative offices continues a process that began in 1982 when Norfolk Southern, formed in the merger of Norfolk and Western and Southern railways, moved its headquarters from Roanoke to Norfolk. Other closures are testing the economic resilience of the Roanoke and New River valleys. Retailer HSN Inc. will close its Roanoke County fulfillment center next year, eliminating 350 jobs. Banking company BB&T Corp. closed its Roanoke call center, and wireless phone service nTelos shuttered its Botetourt County customer support center for a combined loss of nearly 200 jobs. A staff reduction at Allstate Insurance Co.’s Roanoke County customer support center cost another 185 jobs. Despite the spate of job losses, however, optimism remains. The region no longer relies on one, two or even three industries. Indeed, Moody’s has ranked Roanoke and Richmond as the cities with the most diverse economies in Virginia — an attribute that helps cushion the blow. Health care long surpassed the railroad as the region’s largest industry. 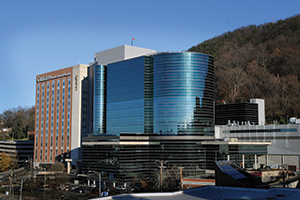 Carilion Clinic employs more than 10,000 people, followed by Virginia Tech with more than 8,000 jobs. More people, however, work for smaller companies, many of which have grown steadily in recent years. Drawing on an expanding pool of local entrepreneurs and companies that have relocated to or expanded in the Roanoke and New River valleys, there are an increasing number of places to work. Developers have invested more than $400 million since 2009 in downtown Roanoke real estate, renovating old warehouses and office buildings for apartments, retail space and other uses. Paired with capital investments that have rebooted the City Market district, Elmwood Park and the Main Library, downtown has been transformed from a 9-to-5 weekday work center to a 24-hour neighborhood that attracts singles and families to its restaurants, stores and festivals. Additionally, major corporate investments announced in the last few years have continued to unfold. New employers include Ardagh Group, a food packaging manufacturer; Korona S.A., a Polish candle maker; Red Sun Farms, a Mexican greenhouse tomato grower; and Falls Stamping & Welding Inc., which provides metal stamping for the automobile industry. Several existing employers, including Volvo Trucks North America; Altec Industries Inc., another truck-related company; and Virginia Transformer Corp. also are expanding. In May, unemployment stood at 4.9 percent in the Roanoke metro area, down from 5.2 percent the year before. In Blacksburg, the jobless rate stood at 5.3 percent, down from 5.6 percent. The May statistics don’t reflect the Norfolk Southern losses, which won’t wrap up until the end of summer. After news of the Norfolk Southern announcement broke, Joyce Waugh, executive director of the Roanoke Regional Chamber of Commerce, saw a flurry of activity between local businesses and railroad employees who did not wish to leave the region. Her story illustrates the desire of local companies to recruit well-qualified workers and the attractiveness of the Roanoke and New River valleys. The region features a low cost of living and high quality of life, plenty of access to outdoors recreation, a central location along the East Coast, cultural amenities in urban and rural settings and many institutions of higher education, including Virginia Tech, Radford University, Hollins University, Ferrum College, Roanoke College and two community colleges, which partner with the private sector to provide specialized workforce development. For many of those reasons, Dennis Cronk of commercial real estate group Poe & Cronk says he’s seeing more activity now than he has since the Great Recession. Industrial and retail properties have been especially hot, Cronk says, to the point where inventory in those sectors is becoming scarce. Those spaces are being filled by smaller companies that are looking to grow. Particularly since the recession, entrepreneurship has become much more important to the regional economy. Virginia Tech engineering graduates Jack DuFour and Alley Heffern failed to win funding for their fair-trade backpack business, Taaluma Totes, when they appeared on the television show “Shark Tank” in February, but they benefited from the exposure and attracted investment from other sources. They are among the many entrepreneurs in the region who are building viable companies. Samantha Steidle founded the Roanoke Business Lounge in 2012 as a place for small businesses and startups to share space and save on operating costs. Last year she moved and rebranded as the Grandin CoLab, which now is home to 107 clients. Some are nearly ready to move to the next level, including Momentum Solutionz, an IT consulting group that was featured this spring in Forbes, and Freak Athletics, which produces athletic training videos that have caught the attention of major brands and millions of YouTube viewers. Fast-growing companies like these, which are ready for the next step of development, tend to hit the sweet spot for Jonathan Whitt, president and CEO of the Roanoke-Blacksburg Technology Council. In March, Roanoke received a $600,000 grant to renovate a former hospital building into the Gill Memorial Technology Accelerator, which aims to help growing tech companies make that jump. Whitt says he sees enormous potential in the region’s bioscience, IT, big data and cybersecurity sectors. Other infrastructure pieces are coming into place as well. The Virginia Department of Transportation is expanding the Interstate 581 interchange at Valley View Mall, western Virginia’s biggest retail center, which will improve access and open 100 forested acres on the west side of the interstate to potential development. Other transportation projects on I-81 and other major merchant routes may boost the region’s profile as a centrally located hub with proximity to major East Coast metropolitan areas. Local governments are working together to fill other gaps in infrastructure. The Western Virginia Water Authority, formed in 2004 to provide sewer and water service to the Roanoke Valley, has expanded to include new counties, most recently Botetourt County. More recently, the Western Virginia Industrial Facility Authority was formed to give Roanoke Valley governments more flexibility to strike agreements and work together to attract large business prospects. The authority has compiled a list of the 10 most promising, larger-than-100-acre, potential industrial sites for future growth. The authority was modeled in part on Virginia’s First Regional Industrial Facilities Authority, which includes 13 localities and operates the New River Valley Commerce Park. The Roanoke Valley Broadband Authority was formed in 2013, five years after the New River Valley Network Wireless Authority. Both work to coordinate public and private efforts to develop fiber-optic cable networks in the region. The authority pitched an $8.2 million, 60-mile fiber project that won approval from Roanoke and Salem, but not Roanoke County and Botetourt County. As a result, the proposal was downsized for the two cities with the hopes of building approximately 46 miles of broadband fiber between them. Even with occasional hiccups in these regional infrastructure projects, companies continue to grow. Roanoke-based Interactive Achievement develops software for school systems to help with testing and preparing students for standardized tests. “They’ve been in growth mode like you wouldn’t believe,” says the Technology Council’s Whitt. Foxguard/Qualtrax, a quickly growing Blacksburg business, oversees smaller companies that develop security software and make computer equipment designed for rugged environments. Meridium assists clients in more than 75 countries improving their businesses and meeting regulatory requirements. 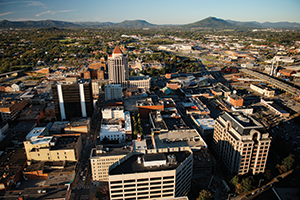 It has offices in Houston, Madrid, Dubai, Bangalore, Singapore, Perth and Johannesburg, with its headquarters located in downtown Roanoke. Crowning Touch Senior Moving Services acts as a one-stop shop for seniors who are downsizing and moving to new living spaces. It handles all aspects of the move: transferring belongings, selling the old house as-is and assisting in disposing of unneeded items through auctions and its consignment store. Linda Balentine, its founder and president, started the company 20 years ago while living out of two friends’ houses and relying on a single cell phone. Today, she has 22 employees and recently began franchising the company, planning 100 new Crowning Touch locations in the next five years, all in metropolitan areas with 1 million or more people. 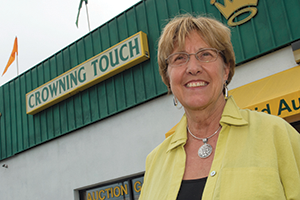 Balentine says she’s been courted by potential franchisees looking to open Crowning Touch locations in Iraq — she turned that one down — and the United Kingdom. A mid-June weekend found her pitching the company at the International Franchise Expo in New York City. That’s the kind of business growth that economic development advocates say represents the future of the Roanoke and New River valleys.